U.S. Sen. Ted Cruz and former Texas Gov.Rick Perry each had the support of 4 percent of registered voters who identified themselves as Republicans in a newWashington Post/ABC News poll. At first blush, 4 percent appears to be an insignificant number. But both men will make the cut if Fox News takes this poll into account when deciding which 10 Republican presidential candidates appear in the upcoming Aug. 6 presidential debate. Cruz had a slight leg up over Perry in the survey when all self-identified Republican respondents were polled — not just registered voters. 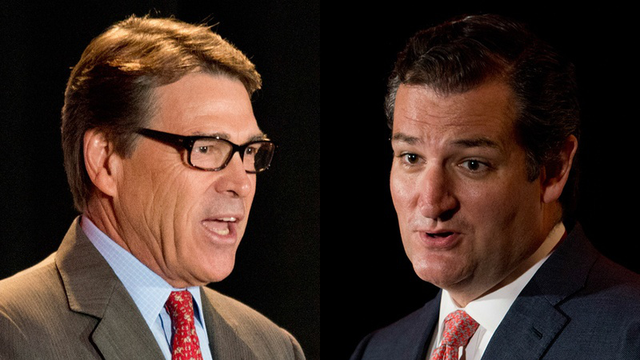 In that group, Cruz got 4 percent while Perry got 3 percent. The numbers in this latest poll showed a decline for Cruz since his late-March announcement. Meanwhile, the survey reflected a sharp rise for billionaire Donald Trump, who appeared to be taking support away from Texas' junior senator. Perry, conversely, showed slight growth. He registered at 1 and 2 percent in Washington Post/ABC News surveys earlier this year. The Washington Post and ABC News conducted the poll from July 16 to July 19. The full survey showed Trump with a commanding lead, but a sharp day-to-day drop off after his controversial comments about Sen. John McCain, R-Ariz. The total poll had a sample size of 1,002 respondents, 351 interviewed over landline phones and 651 interviewed by cellphone. The full survey had a 3.5-point margin of error. The Republican portion of the poll had 341 respondents, with a 6.5-point margin of error.